There is so much hurt going on in the body of Christ. Saints are going through trials and tribulations like never before. As the days draw to a close, a time when our Lord Jesus Christ will come back to whisk us away to glory, the enemy has done on a vehement rampage against God’s people everywhere. Paul, when he wrote his letter to the Philippian church, knew something of hardships. He was imprisoned and he was put in a place of affliction and hurt. So, when he writes of the faith he has that the saints will help pray his deliverance, he knew what he was talking about. There is a wonderful bond in the body of Christ that is like no other. Unity, love and compassion mean so much to our survival that our very witness to the world depends on it. There has been over the past few years an awareness of how we have hurt not only one another, but our witness before the world through gossiping and the tearing down of one another. Jesus Himself said, “By this will all men know that you are My disciples, if you have love for one another,” (John 13:35, NKJV). Having sincere love toward another means that we would want what’s best for them. Even if it means exalting somebody higher than yourself; putting the petitions of prayer that someone else so desperately needs above your own. We often hear the encouragement that, “The effectual fervent prayer of a righteous man availeth much,” (James 5:16, KJV). To avail means that we have a God-given right to have the upper hand, through prayer, against any foe that would dare to rise up against one of God’s anointed ones. How are we using that advantage? Are we selfishly gleaning all the grapes off the vine of blessings for ourselves, or do we have enough Christian courage to let another feast off of your effectual, fervent prayers before you get a taste? Paul openly admitted that on several occasions how much he was dependent upon the prayers of those who had his back in ministry. Despite his supposed super saint/apostleship position, he realized that the sweet aromas of selfless petitions were being put up to God on his behalf. Because of that, he was assured that he would see deliverance. How much care and emphasis do you really put on the body of Christ when you bow the knee to the Father? How much is that hunger in you to see the salvation of the unsaved of your family and friends being fed? Do you really believe that not only will your prayers move mountains in your life but also in the life of another? You may be their only hope, whether they are born or again or not, to draw near to God and receive deliverance. There are some “whips” being laid on others; some burdens that you can help someone else carry if only we would do as the Philippian church did and pray. 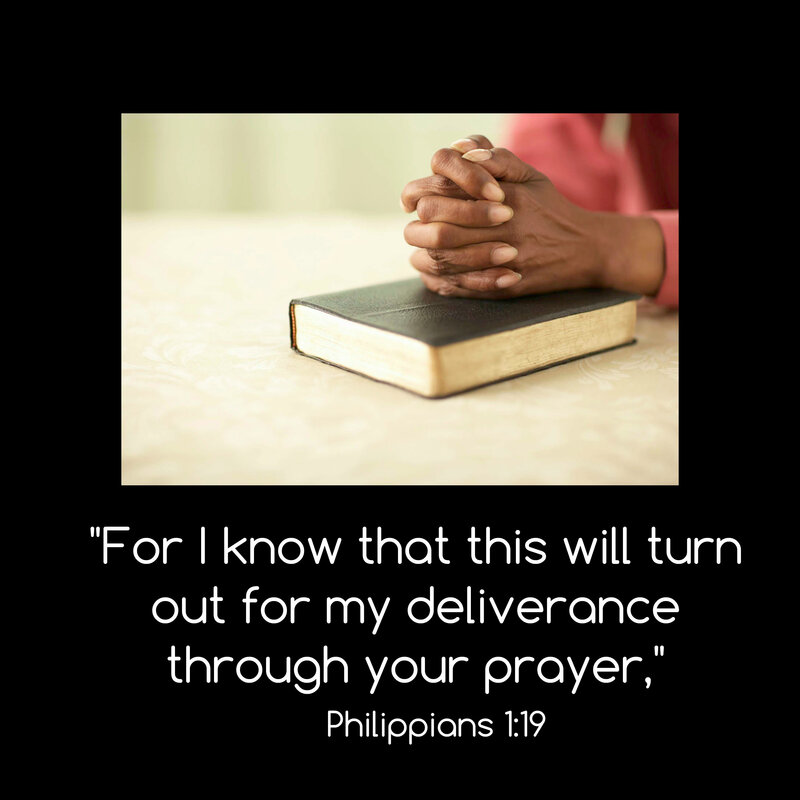 Not just any prayer, but prayers that will let our brothers and sisters know an assurance of seeing deliverance, too. If you want to see true restoration in your own life, learn to put the needs of others before your own. Job 42:10 states, “The Lord restored Job’s losses when he prayed for his friends.” Oswald Chambers, in his devotional “My Utmost for His Highest,” wrote: “As a saved soul, the real business of your life is intercessory prayer,” (Discovery House Publishers, Grand Rapids, Michigan; June 20). Not until Job prayed for his friends were his losses restored.